Disney is no stranger to the fairy tale (understatement of the last century), but princesses, curses and kingdoms are definitely new forays for its partner, digital animation powerhouse, Pixar. John Lasseter and company have always been more preoccupied with breathing life into inanimate objects and giving vocal cords to animals, so a film with humans taking place in the Scottish highlands and only lightly sprinkled with magic, is starkly traditional by comparison. For a studio so pristinely viewed by the masses as the cutting edge of animated storytelling to retreat to one of the world’s most ancient forms of storytelling might seem a bit confusing and maybe even disappointing, but Pixar does all that it does so well with “Brave,” even if the means and the ends are all too familiar. Firstly, Merida (voiced by Kelly Macdonald) would put all the classic Disney Princesses to shame. If they all gathered in the same room, she would stand out with her frizzled red hair and generally antsy disposition, not to mention think them all lame and boring for being dainty and predictable. Although the princess who would rather shoot arrows and run around outside all day than learn how to sit and speak properly is far from an original thought (these days you might consider her a cross between Katniss Everdeen and Arya Stark), Disney desperately needed a heroine who is self-sufficient and strong enough not to need a male co-star and Merida is perfect in that regard. She’s not merely rebellious for the sake of the story, but you truly feel as if her character is not fit for a life of royalty. The movie follows a predictable path but a likable one, likable in its familiarity and likable because the issues and themes it speaks to are timeless. The core of the story is Merida’s relationship with her mother, Queen Elinor (Emma Thompson). As it comes time for the lords of the three tribes to champion their sons for Merida’s hand, the strain in their relationship boils over. Elinor tries maddeningly to make Merida understand her duties as princess, but Merida grows frustrated with her mother’s lack of consideration for her own wishes. 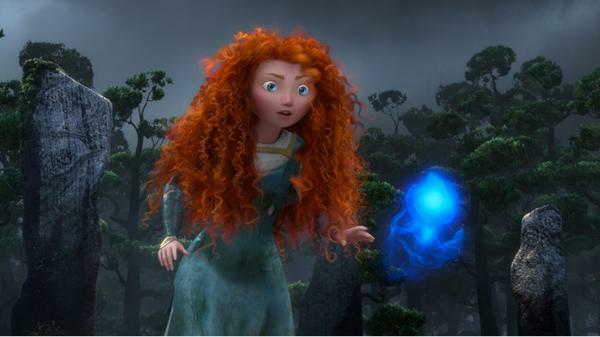 After an awful fight, Merida flees to the forest and follows the will-o’-the-wisps, desperate to change her fate by changing her mother’s mind. After a strange witch presents her with that chance, Merida makes an impetuous choice that has major consequences and challenges her to see just how brave she can be. Merida is also a terrific heroine because she’s not perfect. The Queen is not some evil stepmother, so while we understand Merida’s feelings, we are frustrated with some of her initial choices. Regardless, you root for her the entire time and she successfully carries the weight of the story on her back. The male characters leave a little something to be desired, though the king, Fergus (Billy Connolly), is a lovable character and father. While he has plenty of foolish moments, he’s also responsible and kingly when it’s required of him. The lords from the rest of the kingdom are amusing but wild and one-dimensional until the end when Merida convinces them of one of the most obvious notions in human history. Related to the male characters in the film, the level of needless violence in “Brave” is surprising, though used for comic effect. Even the old witch, who’s in the film for not even 10 minutes, beats her pet crow for no good reason. “The Incredibles” aside, Pixar has not traditionally been known for violence, and one could make the case that “Brave” is a bit scarier than most family-focused offerings. 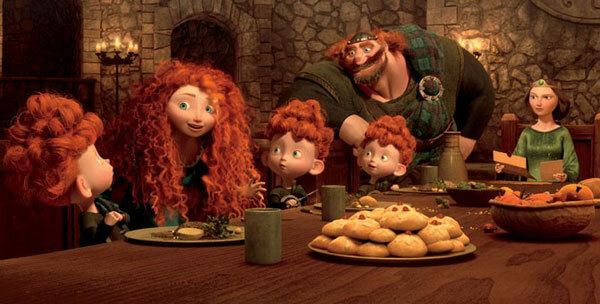 The humor of “Brave” goes beyond physical gags, however, though not into seriously laugh-out-loud territory. 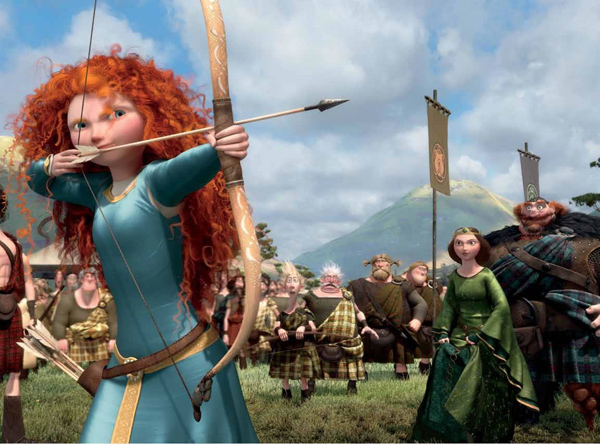 “Brave” is clever in the way you’ve come to expect from Pixar, by using truth, heart and goofy supporting characters. The three triplets are the comic highlight of the film to be sure. And heart is where “Brave” wins points for Pixar yet again. The commitment to storytelling, even if we’re talking basic fairy tale outline with this film in particular, results in plenty of emotional catharsis. Mothers and daughters should particularly be moved by the outcome and moral of this one. Once again, no revelations in terms of the take-home message, but it’s such a relief when Merida finally has her epiphany and learns from her actions. “Brave” receives all the humor, character, heart and visual detail of its Pixar brethren, but much of its achievements will get overlooked. The animation, for example, could be considered among the studio’s finest, yet the story and characters are so engaging you forget about it aside from some sweeping landscape shots. Therefore, the bar set by Pixar is the biggest hurdle for “Brave.” Innovation has always been the studio’s norm, but the only real innovation in in the film is a major plot point that the marketing keeps close to the chest. This will lead some viewers to classify “Brave” as one of Pixar’s “lesser” efforts, but wrongly so. “Brave” is everything you could want from a fairy tale and then some, but a fairy tale is a fairy tale.